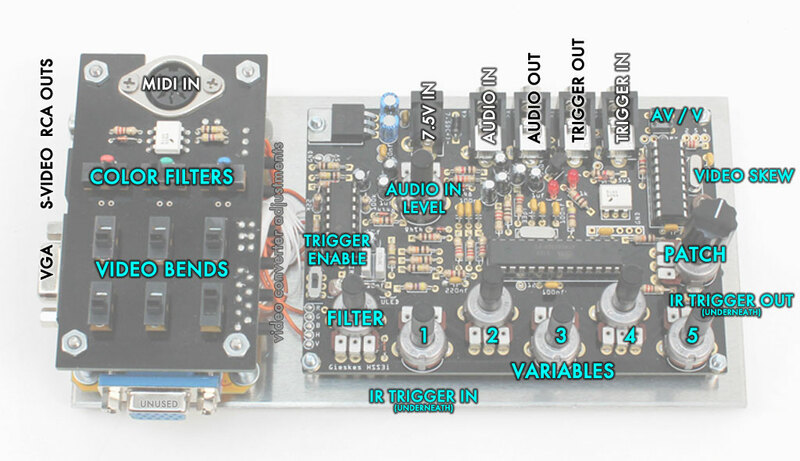 Product page | Build instructions | Code | Board layout | Video, MIDI, bend, and mounting instructions. Only power with 7.5V DC tip positive adapters. Do not use the DC plug on the video device. The small button in the top right corner switches between audio+visual mode (patches S1P..) and and only visual mode (patches V1P..). Use a small screw driver to adjust the screw inside the brown cylinder on the right edge. This changes the angle of the video. Red, green, and blue and can be independently filtered, giving that color softer edges. The HSS3i’s variables can be triggered, IR from Andromeda Space Rocker devices, modular gear, and audio signals. The potentiometer by the power jack controls trims the level of the Audio input. See the patches for what exactly is triggered in each mode. Experiment with different signals inputs or use the HSS3i to control your modular with it’s trigger output!